Do you ever get deja vu? To a lot of us, the feeling is vaguely familiar, like when we hear a song that triggers a distant memory or when we get a hunch that we can’t quite explain. Sometimes we even experience a vivid dream that leaves a deep impression on us- only to resurface in real life in strange ways. For centuries dreams have been used to predict the future, and everyone has their own way of interpreting the signs. One dream in particular sets the tone for your luck in the new year, and it's known as hatsuyume. Hatsuyume is the Japanese word for the first dream had in the New Year. Since the night of December 31st is often spent celebrating the new year and not sleeping much, hatsuyume is the dream had on the night of January 1st. It's believed that this first dream can foretell your luck (or lack thereof) in the upcoming year, and that if you dream of an eggplant, a hawk, and Mount Fuji, you will be especially lucky in the new year. 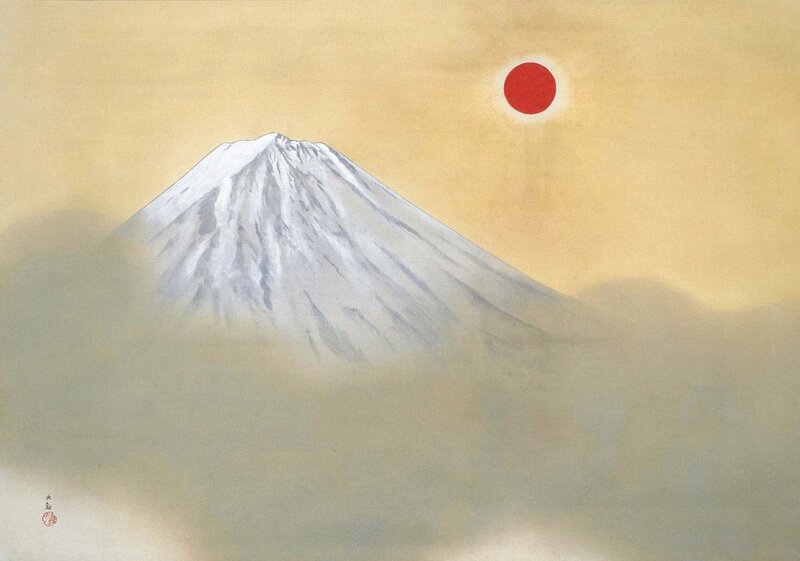 If this combination sounds strange, consider this: Mount Fuji is Japan’s highest mountain, and symbolizes the challenges of accomplishing our goals. The hawk is a clever and strong bird. And the word “eggplant” (nasu or nasubi) is also the Japanese word for achieving something great. When combined, those three symbols become especially powerful omens for achieving your goals. If you’re trying to encourage a lucky dream, you may want to cast your luck in with a higher power. 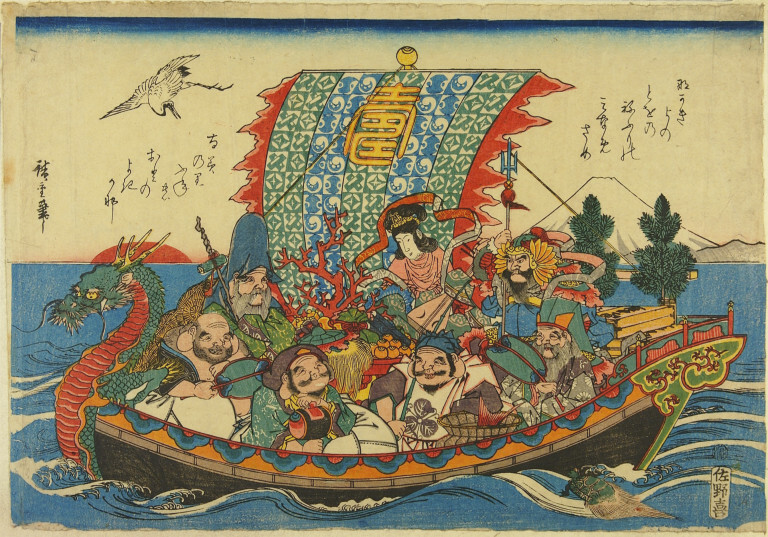 The Seven Deities of Good Fortune (known as Shichi-fuku-jin) are seven lucky gods who bring prosperity, often portrayed balancing over a boat laden with treasures. As the story goes, if you put a picture of the Seven Lucky Deities under your pillow, you’re guaranteed to have a lucky dream, which will in turn give you a lucky year. These gods come from a mix of Hindu, Chinese and Japanese origins, and though they are often pictured together, each one symbolizes a different virtue. Pictured clockwise from top: Benzaiten, the patron of the arts; Kichijoten, the protector of authority and good behavior; Fukurokuju, the god of happiness; Ebisu, the patron of fishermen; Daikokuten, the household deity of wealth; Hotei, the guardian of children, and Jurojin, the patron of the elderly. Ebisu The only originally Japanese god on the ship, Ebisu is the god of prosperity and wealth in business. He also brings abundance of crops and is the patron of fishermen, and many seafood restaurants display his image. He is often pictured wearing a fisherman’s costume and holding a large fish, symbolizing abundance in meals. Daikokuten Daikokuten is the deity of wealth and the household, particularly the kitchen. Originally from India, this god sits on a bag of rice and carries a big sack on his back. He also carries a golden good-luck mallet. His image was onced used on the first Japanese bank note. Benzaiten: As the only female deity in the group, Benzaiten is beautiful, smart and well-versed in music and the arts, as was expected of accomplished women. This goddess is the patron of artists, geisha, writers, musicians and performers. She’s often pictured in Japanese temples, playing a biwa, a kind of lute, and accompanied by a white snake. Fukurokuju The chinese deity of happiness and long life. He carries a treasure ball and a pillow- because there’s nothing that brings us happiness quite like a ball and a long fitful sleep. Jurojin The chinese deity of the elderly and long life, Jurojin is distinguished by his long head and long white beard. He is often pictured carrying a fan and a scroll, inside of which the length of everybody’s life is written. He is sometimes accompanied by a crane and a tortoise, which are symbols of longevity. Hotei As the god of popularity, guardian of children, and the patron of diviners and barmen, Hotei has a lot of ground to cover. He is usually depicted with an enormous belly and his shirt half-open, and carrying a big bag on his back loaded with fortunes for those who believe in him. It is said that people who pray to him are blessed with children. Kichijoten As the guardian of Buddha’s Laws, Kichijoten is the protector of good behavior and those who abide by the rules. He is also the patron of fighters and authority figures, and foretells good fortune in war and battles. Kichijoten protects holy sites, and carries a weapon to fight off evil spirits on his right hand, while his left carries a small pagoda containing Buddha’s ashes. From Us: Happy New Year!